".........have I heard a better turntable this side of £4000? No, I haven't, simple as that. The Manfred MK2 displays all the hallmarks of those exclusive decks that just sound 'right' - no question this is a result of the teutonic engineering lavished on this deck, and no need to break it down any further than that - when you simply want to cue up another, and another, and another LP, and find yourself smiling unconsciously, you know you have something outstanding on your hands......."
The Manfred Mk2 turntable is manufactured using a choice of sumptuous real wood veneers, something you would expect on a high end speaker system rather than an entry level turntable, or painted high gloss piano black or white. The solid wooden plinth carries the substantial high mass turntable platter bearing housing and tone arm mounting plate. The turntable motor unit is remotely sited, close to the plinth, and is the same motor as is used in our high end turntables, powered from our S-Alpha regenerative power supply unit. The turntable platter is solid machined aluminium, 34mm thick and weighing 6kg. The platter is made of a very soft alloy to optimize its periodic resonance, and is coated on the rear side with resonance-reducing material. Existing vibration energy is quickly reduced and the Platter is immediately steadied. The design is optimised to ensure both air borne and operating vibration energy is damped and, to present the best operating conditions for your arm and cartridge and offer you the best sound from your vinyl collection. The platter bearing is the heart of every turntable and Acoustic Signature have invented a bearing with the ideal performance characteristics of exact fit, extremely low noise, very low friction and long term stability. The platter bearing component is manufactured from special hardened and polished steel. The bearing housing uses perfectly matched sinter bronze inserts which are self-lubricating; and therefore maintenance free. At the base of the bearing, we use our specially developed ‘high-tech’ material TIDORFOLON. All bearings in Acoustic Signature turntables are designed to run dry - without oil. The remotely sited drive motor sits neatly within a special aperture in the Manfred Mk2 plinth, an elegant and practical solution to ensure vibration isolation in the plinth is minimised. The sophisticated electronic control is provided by the ‘S’ Alpha electronic motor controller, a single motor controller, similar to its ‘big brother’ Alpha controller, as used with more expensive Acoustic Signature turntables. It converts the incoming AC mains voltage to DC current and a precision oscillator then produces a perfect sine wave at 12VAC to run the motor, resulting in a perfectly steady and constant platter rotation. The motor power supply is impervious to the negative effects of mains voltage fluctuations and household appliances that produce ‘noisy’ mains that can have a very great detrimental effect on AC motors and therefore the turntable performance and ultimately the sound. 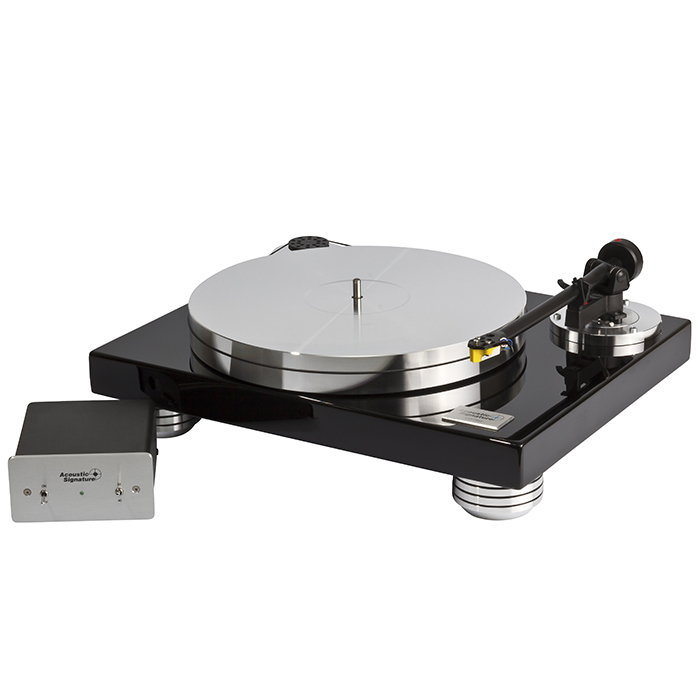 The Manfred Mk2 turntable can be specified and delivered with any production Rega tone arm, like the RB 251 or RB 301; or supplied with a tone arm mounting plate to suit any other 9 inch arm. These arm plates are exchangeable if you decide to change your arm. The plinth has three adjustable feet for simple macro and micro adjustments to level the turntable. The Manfred MK2 is available in real wood maple and cherry, or piano black or white high gloss paint finishes to special order. The Manfred Mk2 uses design concepts incorporated throughout the Acoustic Signature turntable range: such as a high mass platter design, very low bearing noise and friction, perfect motor drive control, and highest precision German design and engineering. This guarantees long term reliability and high performance; it ensures that every Manfred MK2 is exactly the same, as we produce nearly every part on our precision computer controlled machines. The Manfred MK2 is available in maple, cherry or piano black or white. Occasionally, due to stock demand, we can sell out. If this occurs when you make a purchase, we will inform you quickly. Most out of stock items are available for dispatch within 3 working days. If your purchase is urgent, use this form for a priority price and stock availability check. All pre-owned items are in stock and available for next day delivery if order placed before 1pm. Enquiries will be responded to within 1 hour during office hours. If you would like a quote please fill in the form below with as much detail as possible and we'll get back to you with a price.